Kenya’s Lunatic Line: Riding the Iron Snake’s Last Run (Part 2) – Greg Kelsey. Writer, traveller, fumbler. The guard looked at me, non-plussed. “Your cabin is all the way up there,” she gestured to the front of the train. Its inception was barely a blip on the horizon. I thanked her and set off. This train has been in operation for over 100 years. Nowadays, a single black-throated diesel drags this machine over 600 miles to its destination, twice per week. It has a terrible reputation for punctuality: it can be as much as three days(!) late. When I reach the front, my carriage and compartment are fairly easy to locate. My room is made for 2 people, with one fold-out bed at head height, and another at seat level. The seats are grimy, blackened with the sweat of generations. A drinking water dispenser sits above a small sink and does, in fact, release a thin stream of liquid when teased into action, but whether it is actually water and/or drinkable is a question I don’t intend to investigate. A non-functional, art-deco fan ornaments the wall. There are also two ash trays, a cup holder, a light, a rubbish bin, and cupboard. The corridor is barely wide enough for a single person of modest build. Two cannot pass. The African sun is streaming in the window. It’s airless and roasting, and although I open a window, sweat drips from my arms almost instantly. There are toilets at each end of the carriage, and some are squats, the piss-hole leading directly onto the tracks. If I drop my glasses down there, they are gone for good. This cabin is comfortable enough, but things will get awkward if I’m joined by a stranger, and I pray that the other seat isn’t booked. There is very little movement on the platform to suggest that there will be a rush of occupants, though. At 4.55pm there is an announcement: the train will leave in five minutes, all passengers please board. Thankfully, no-one joins me, and I settle into solitary relaxation. The train clunks into activity. Without fanfare, it rumbles slowly through the outskirts of Mombasa, where houses and shacks edge right up to the tracks, which seem to be somewhat of a refuse depot. Masses of household garbage mount up and stink the verge. Small children make smiling runs alongside, waving and yelling “Jambo”. Some just stand, dreaming the train will one day take them away, out from the small compass of their lives and into something bigger. Eventually, the city gives way to savannah and small villages. 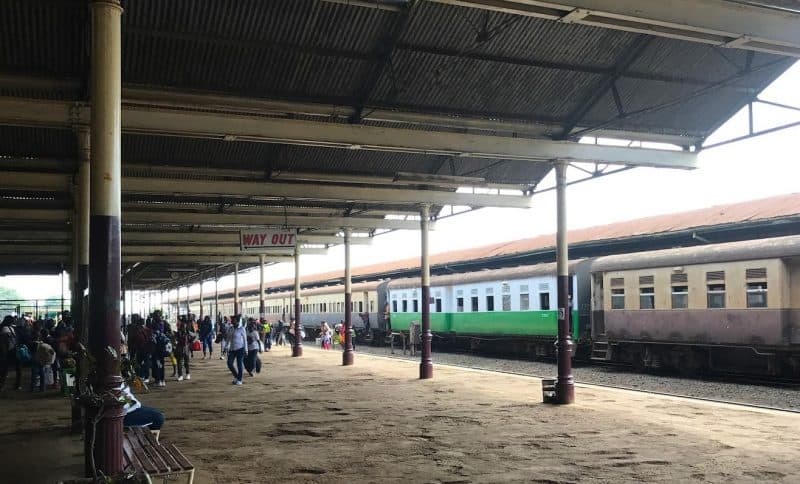 This line is properly known as the Uganda Railway, so named because the line was originally meant to terminate there, or at least at the close-by town of Kisumu, on the Eastern side of Lake Victoria. In fact, the line to Kisumu was discontinued in 2012. In the 1990s, the trip took 12 hours, though through neglect and lack of maintenance travel times have blown out to its current 24 hours. The Railway shop in Mombasa. Construction commenced in 1896 when European countries were scrambling for influence in Africa. The British East Africa Company employed over 30,000 Indian workers at the then extraordinary equivalent cost of 650 million pounds. There is still a thriving Indian community in Kenya as a consequence. Construction was far from smooth, with dozens of workers being killed by hungry lions, and it was dubbed “The Lunatic Line” by an angry and parsimonious British Parliament. A smiling fellow in a shabby uniform introduces himself as my valet and confirms that I’m the only passenger in my compartment. 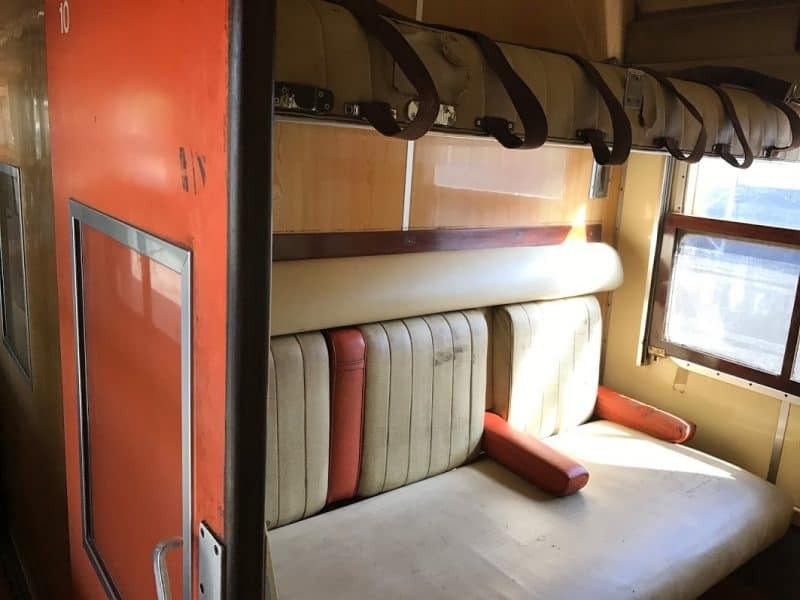 It turns out that this isn’t at all unusual: the train rarely carries more than a dozen in first class and 50 in total. A third-class ticket is only about $7. Arriving at the old Nairobi station. Dinner will be served at 7 pm, he says, listen out for the bell. Most importantly, he says there is a bar, selling beer, open right now in the next carriage if I want one. By god, I want one: it’s sweltering, and my face must be gleaming with sweat. Unfortunately, he proves to be wrong. Although the next carriage is definitely the dining car, there is no bar open, at least not yet. Well, we’ve only just started: perhaps they need a little while to set up. In an hour, I again go searching. The dining car is deserted. I’m about to knock on the kitchen door when I hear the crash of a dozen pots and pans, accompanied by Swahili curses. They’ve obviously come adrift with the jolting of the train and ended up on the floor. I don’t think my intrusion would be welcome, and I slink away.